KIEV, Ukraine -- Since September 20, Crimean Tatar activists and other protesters—mostly from the Right Sector—have been blockading the flow of goods from mainland Ukraine to Crimea. Russian security forces attempt to block the way for Crimean Tatars crossing a checkpoint connecting Crimea and the Kherson region on May 3, 2014. Since September 20, Crimean Tatar activists and other protesters—mostly from the Right Sector—have been blockading the flow of goods from mainland Ukraine to Crimea. The Kiev government has neither formally supported nor criticized the move. The reaction among analysts, observers and bloggers has been mixed—from enthusiasm to caution and even downright criticism. Mustafa Jemilev, leader of the Crimean Tatars, had been advocating a blockade of Crimea for months, warning that 80 percent of the trucks en route to the peninsula end up in Russia as their final destination. It seems that Ukrainian President Petro Poroshenko eventually heard Jemilev's message and decided to support the blockade indirectly. Jemilev was recently appointed as head of the Anti-Corruption Council; he was also visible in the front row of Ukraine's delegation to the United Nations General Assembly in September. Thus, the Ukrainian government smartly used the blockade in its recent diplomatic offensive against the Kremlin. But what is the blockade likely to achieve? Besides direct economic effects, it also has foreign policy objectives. One of its stated objectives was to call international attention to Crimea's annexation as well as human rights violations, including the persecution of Crimean Tatars. The blockade seeks to support Tatars living in Crimea, which Russia is trying to split politically. 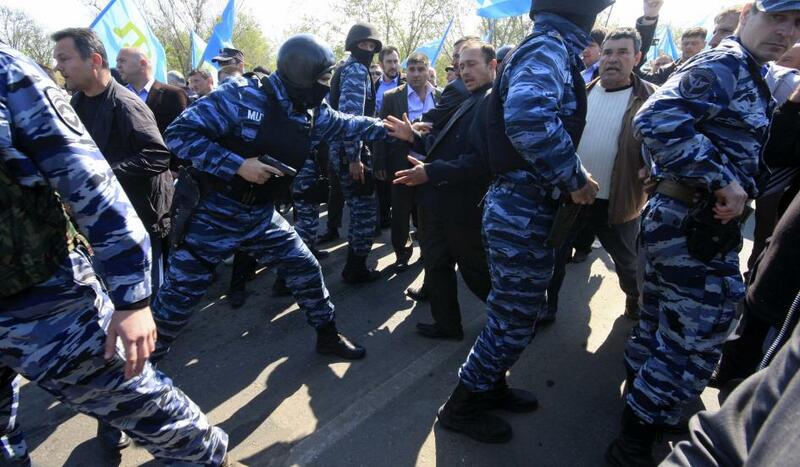 In fact, the Crimean Prosecutor's Office recently warned the media against the official use of the term Mejlis. On October 5, Warsaw University's Ridwan Bari de Urcosta told me of a widely shared concern among Crimean Tatars still on the peninsula that Russian authorities might use the blockade to crack down on the Mejlis as the only legitimate people's assembly. As an instrument of Russo-Ukraine economic warfare, Kiev perceives the blockade as having little effect, though it is likely to raise Russia's cost for subsidizing the annexed peninsula. Ukrainian media reported that food prices surged by 150 percent in the first week. Even though Russia was able to ferry in food supplies, and local authorities promoted local produce, recent media interviews suggest the blockade continues to boost prices. For the Ukrainian government, the blockade was of short-term extraordinary help in curbing smuggling and corruption associated with trade flows to Crimea's free economic zone—a gray market in Russian-Ukrainian trade—established in August 2014. In the first eight months of 2015, mainland Ukrainian exports to Crimea came to $610 million, according to both Ukrainian and Russian media. Yet nominally, the blockade reduced actual volumes of Ukrainian-Russian trade. The Kiev government's representatives seem to be cautious about this issue. Anton Herashchenko, a deputy with Prime Minister Arseniy Yatsenyuk's People's Front, believes the law should regulate which goods should be sold to Crimea. Another argument is to look at Ukrainian food products in Crimea as elements of Ukrainian soft power; indeed, some reports indicated that Crimean customers refused to buy inferior-quality Russian dairy products. Russia attempted to counter these messages in its propaganda; a RIA Novosti poll found that of the 18 percent of Crimean residents who prefer Ukrainian goods to Russian, almost 10 percent do so for price and not quality reasons. But even so, the macro impact is not necessarily negative for Ukraine. Another key aspect of the blockade is Ukrainian domestic politics. The government's informal support of Mejlis activists has a positive impact on a society marked by weak state institutions and growing public discontent. The government benefits from the activists' integrity, enthusiasm and lack of bureaucracy. There is a downside, however, as some radical groups might hijack the protest. The Right Sector may benefit from the blockade, with recent polls showing that its public support has grown to 6 percent. There are limits, of course, to the effectiveness of power-sharing with activist groups. Odessa Oblast Governor Mikheil Saakashvili warned that government should retain its monopoly on the use of force in Crimea's blockade. Russian appointees in Crimea's government immediately exploited the Right Sector's participation in the blockade, with Crimean Deputy Prime Minister Ruslan Balbek placing it on the same footing with the word Mejlis. Meanwhile, the Crimean government has made some symbolic political gestures. On October 1, for example, Crimean Prime Minister Sergey Aksenov visited the construction site of a new bridge over the Kerch Strait, which will connect Crimea and Russia. Yet the bridge won't be fully operational if all goes according to plan until June 2019. Activists have said that the protest might last for years. But if they disrupt the supply of electricity, this could carry significant economic, political and even military risks for Ukraine.